Mission: To consult, plan, install, and move any commercial business through excellent communication, quality, safety, efficiency, and cost effective execution exceeding all client expectations and industry standards. We are a full-service moving company which also specializes in furniture installation. 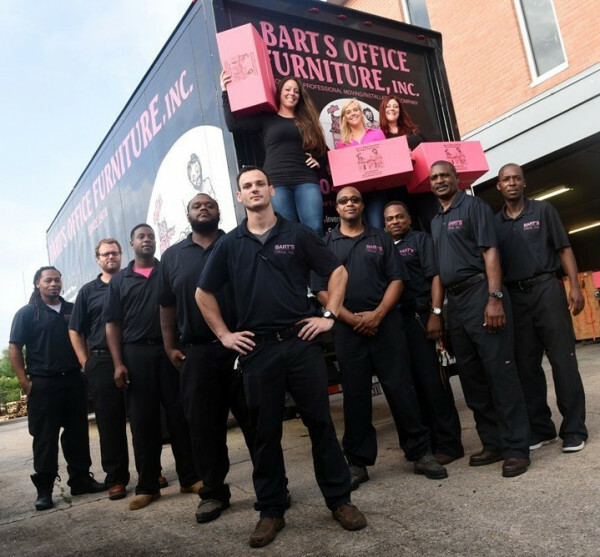 Our most obvious and distinguishing factor is that we are a women owned and operated moving company in an industry traditionally dominated by men. Women think it is empowering, and men think it’s funny, until they see us move. Then women are even more empowered, and the men are usually picking their jaws up off the floor. Our mission is to provide efficient, cost effective moves, which minimize operational downtime and smoothly transition companies into their new facilities. We will continue to provide excellent commercial office moving and installation services. We accomplish this by maintaining a skilled, qualified workforce and utilizing our extensive experience in moving a variety of facilities. Our customers will receive exceptional services to assist with the continued success of their business. We will continue to be a trustworthy corporation that has maintained our customer base, by never leaving a customer unsatisfied with our service. Project analysis is a most critical phase of project execution. The better a project is analyzed, the better it is executed. The analysis report serves as the base of the entire execution. The client’s requirements, the project goals, the future scope of the project, available resources, required skills, required tools, pricing and the time span are the subjects of analysis at this phase. Project analysts in cooperation with project managers perform this task ensuring attention to details, risks and challenges, associated with the project, are analyzed too. Once the project deadline is fixed based on the project analysis report, the project plan is chalked out. Planning is a critical requirement to decide on the mode and approach of executing the project. The more prepared you are in the planning process, the more efficient the project execution. According to the plan, tasks at different phases of the execution are allocated to the development team, & divided into different units. If needed, a special team of technicians is built with skills needed to complete the project. Project execution is the most crucial phase which demands attention and dedication on part of developers, as well as the technicians. The selected project development model is deployed in this process. With continuous flow of the project execution phases, the methodology is followed to the point. The project manager leading the team acts as a project coordinator too. They ensure precise coordination among the units of the team to get the project executed in a timely manner as it is planned. Quality project management plays instrumental project execution. Once all details of a project have been executed a final walk thru of the space is coordinated with the client. Depending on client preference, project size, complexity, and scope a post project meeting is held to discuss execution.